I recently became aware of a horrible injustice perpetrated by the folks who vote on movies over at IMDb, namely the inclusion of several movies in IMDb's Bottom 100 Films that really don't belong. Case in point is this non-Elm Street Robert Englund vehicle. Now, I'll grant you, if you went to the theatre or rented this expecting the horror equivalent of The Lion in Winter, then you came away sadly disappointed, to say the least, but you can hardly fault the film for your own lofty expectations. This is a horror film, people; next time you're looking for Shakespearean-level drama, go rent Olivier's Richard III. However, if, like me, you are looking for an entertaining spook movie that keeps your attention to the end, then The Mangler is going to be right up your alley. The talented-but-wildly-uneven Tobe Hooper co-wrote and directed this tasty little variation on the slasher genre set in a commercial laundry. The owner of the factory, played by the aforementioned Englund, is a disfigured chap whose body looks as though he has made supplication at the altar of the Goddess of Workers' Compensation too often by half. He rules his employees with an iron fist - although as far as we can tell, that's metaphorical - and his downtrodden workers are about as oppressed as you're likely to find in a real sweatshop, much less a cinematic one. Of course, this being a horror film, things are naturally not what they seem, especially after a particularly gruesome accident involving the eponymous ancient laundry-folding machine. 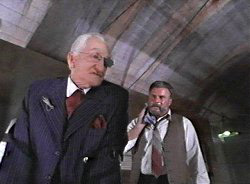 The Mangler is one of those rare films to which it would be a disservice to impart any more of the plot than what is offered above. For while the viewer gleans a fair bit of the film's direction early on, the most interesting developments are not easily sussed, and the film's twist comes as a nice surprise, and a thoroughly earned one at that. One word of advice, however; under no circumstances should you make the mistake of renting/recording/otherwise endeavoring to view the apparent sequel titled The Mangler 2. Not only does that film not have anything whatsoever to do with the original, but unlike American Psycho 2, the non-related/same-titled not-really-sequel is a load of complete shite.